Thank you for choosing our beautifully restored shingle-style Victorian. 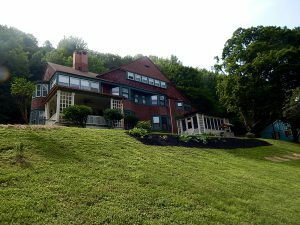 Bryn Brooke Manor graces three hilltop acres within the Village of Cooperstown, just a stone’s throw from the historic Otesaga Hotel and walking distance to all three major museums and Main Street. Our spacious rooms include comfortable beds, thick towels and robes, charming decor, plus the 21st century conveniences of split unit climate control, high speed internet, television, and a refrigerator with freezer. A true labor of love, we invite you to enjoy all the nineteenth century gilded age charm of our architecturally significant home. Marvel at the butternut wainscoting, the dual staircases for family and servants, hardwood floors throughout, and the inviting gardens outside. Brewery Ommegang. Great Belgian ales, including their exclusive Game of Thrones series, and fabulous concerts. Restaurant on premise. Smithy Gallery and Clay Studio. Wonderful local gallery in Cooperstown’s oldest building. Concerts and clay studio, as well. Muses abound! Cooperstown Farmers Market. A Saturday morning tradition, also Tuesday afternoon in July and August. Classic Car Museum. About an hour from Cooperstown and absolutely worth the drive for a car fancier or history buff. Bryn Brooke Manor is open for the season! Please call the Bryn Brooke office at 607-547-1870 or Brenda directly at 607-287-0162 for reservations. The Bryn Brooke Breakfast, including farm fresh eggs, local meats, fresh baked goods, Chobani yogurt, our own homemade granola, fresh fruit, coffee and juice, is included in your rate. © 2019 Bryn Brooke Manor. All Rights Reserved. designed by pogo stick studios.